When I first saw this on Indiblogger I was excited but was equally apprehensive about it. But as there was no cost involved, I thought there was no harm in trying it for my mother, who suffered from split ends. I decided to give it a shot and applied for a free sample. I heard nothing from them for a few days and I had simply forgotten it. Suddenly one day I got a call fom them confirming my address and there it was next day at my doorstep. I was glad to receive the package as it was very nicely packed and wrapped inside a beautiful bag. So as I mentioned earlier I asked my mother to use it daily for the next month or till it lasts. In a fortnight it was showing its effect and she was very happy with the results. I was not really convinced at only this and hence I got in touch with my cousin who also suffered the same problem as my mother. 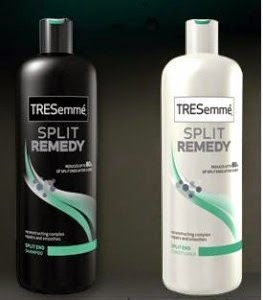 I informed her about the said contest by TRESemme and convinced her to buy the TRESemme Split Remedy kit (only shampoo and conditioner in this case) from the market and continue using it daily atleast for a fortnight or further. My curiosity was getting a better of me and I kept inquiring with her about the results on daily basis. Irritated with my continuous persistence for a week, one day she told me that this was not at all helping and she would not be using it any longer. I was assured that this contest is one more marketing gimmick used by the companies to facilitate their products in the market and use the blogger community for farther reach without spending much on the marketing. To my surprise a week later I received a call from her and all she spoke was about how good the split remedy has worked for her and results where there to be seen. The split ends and the loss of density of her hair was now a history. Her hairs have become thick and shinning black. 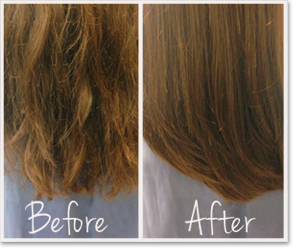 She vowed by TRESemme products for the rest of her life. She went on to add further that, now that she is at peace with her hairs, it has also added to her improved self confidence and she is also not worried about her bun when traveling or going out in the sun. This was very strange as my mother was most happy only to do away with the persisting split end problem. I never thought it would also be beneficial in the ways my sister informed me. I also realised that it’s just tall promises and fancy campaigns that help a company to reach distances and go places and increase the sale of their products, but it’s the results that are delivered in the promised time frames that gets it a loyal customer base. In view of above I would recommend all females facing the split end problem to regularly use TRESemme Split Remedy and you’ll never be worried about the nudging issue and you hair will be much much better. I would also like to add here that both my mother and sister had earlier used Dove but the results very far from satisfactory.